Morning came on June 23 telling us to pack up camp and head across Spain towards Barcelona. The Spanish countryside is absolutely breathtaking. Quaint, red-roofed houses are scattered across the hills and the view kept my eyes occupied for hours. After an hour and a half in Zaragoza, we made the final leg of our journey to Barcelona. When we finally arrived in the city, we took a driving tour around the major roads, stopping at an overlook on the highest peak of the city. Barcelona is as bright and colorful as I had hoped. The trees and other foliage are so tropical; all I could think was that I’d finally found my paradise. We stopped again at la Sagrada Familia, the expansive gothic cathedral designed by the famous Spanish architect, Antonio Gaudí. Scaffolding covered the majority of the architectural masterpiece, but we were still able to see the bizarre features of each façade, including fruit, animals and a Christmas tree. After leaving the city, we headed back to the campsite, which was about 30 minutes away. This was by far the best campground we’ve been to so far. Called Tres Estrellas, the campground bordered the beach and was equipped with a pool, full service store, laundry facilities, and night club and a bar. How cool is that? 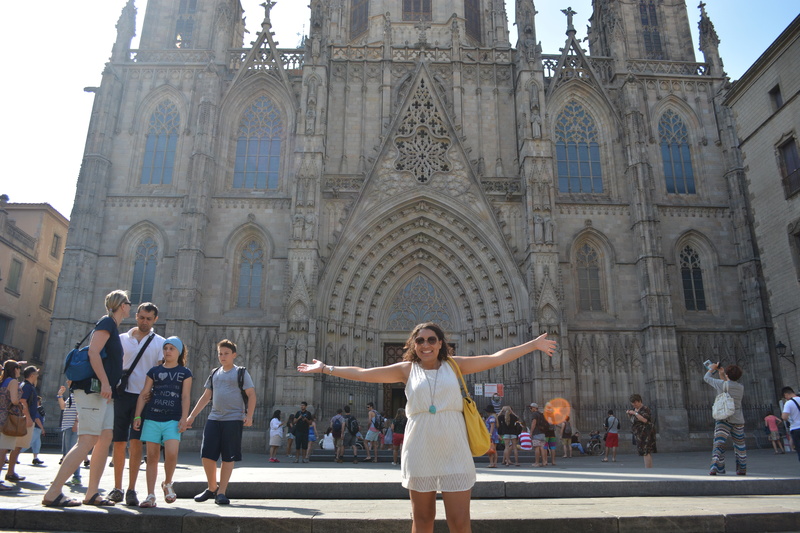 The next day, we went back into Barcelona and started the day with a walking tour of the Gothic Quarter. We roamed the narrow side streets, making our way to the main cathedral in the area. I was mesmerized by the beautiful, authentic gothic architecture and the historical significance (I know I’ve been using that phrase often, but I can’t help that these places have played such important roles in Europe’s history). We learned from one of our tour guides that a courtyard we visited was the site of one of the most deadly attacks on civilians ever to happen in Spain. We roamed the quarter for a while longer, taking plenty of photos before splitting up for free time in the city. 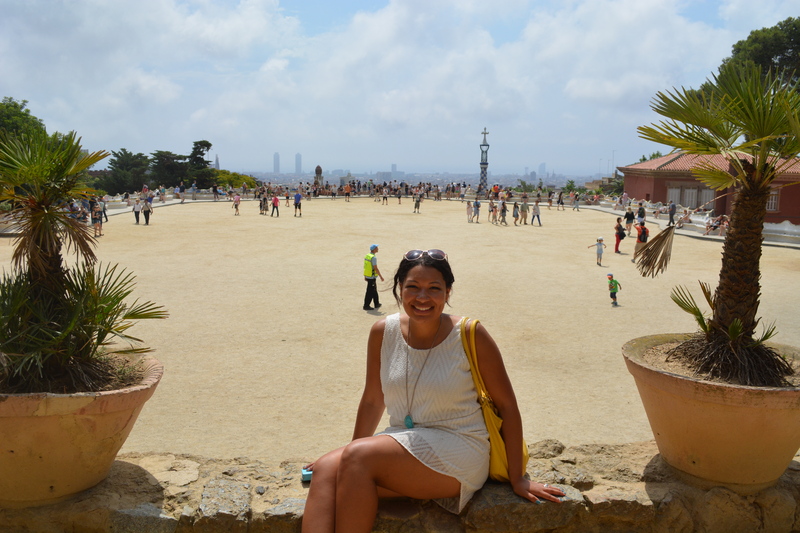 A few friends and I were keen on seeing el Parque Güell, a fantastic park designed by Gaudí that sits raised on the edge of the Barcelona with a beautiful panoramic view of the city A picture of the park has been the background on my laptop for the past year, and I could not have been more excited to go there. Of course, nothing goes smoothly when you’re really excited for something, right? As we rode the metro from the Gothic Quarter and as we climbed the hill on our ascent to the park, I kept raving to my friends about how excited I was to finally visit the place I’ve been dreaming about for months. When we finally arrived in then park, we walked to the spot where my background image was taken, but could not get in! Apparently, the beautiful section of the park where intricate mosaic tiles on a wall create an overlook of the city was a ticketed area. So I told my friends I would go around the corner to inquire about tickets and meet them in back in 15 minutes. Going to the ticket booth, I found that n order to actually get to the overlook, I would have had to wait in line to buy an €8 ticket at a designated time (the next slot available being an hour from that time). I was with a group of people and seriously did not want them to have to wait for me soooo I had to skip out on the thing I was most excited to do in Barcelona. But it’s okay… I’m sure I’ll be back! I went back to meet my friends at our meetup spot but didn’t see them anywhere. I waited about 10 minutes then walked around to look for them, and still nothing. I panicked for a second, but I remembered we had agreed to all get lunch at 1:00 at the food market back near the Gothic Quarter. By then it was 12:30, so I figured my other friends had just headed there already and I could meet them at that spot. So I left the park a little disappointed and took the metro back to our starting point. 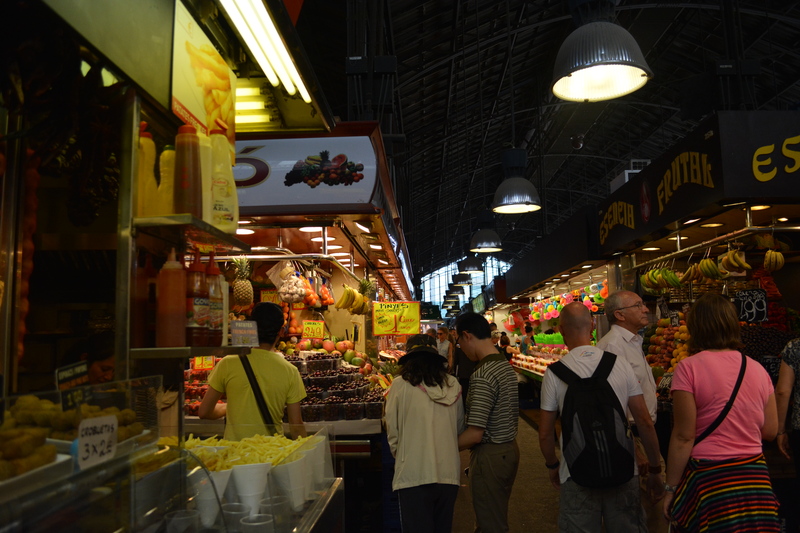 I walked to the food market, getting there at 12:50 and looking around for my friends. Still nothing. I waited for another 20 minutes, wandering around the market in case they were already inside, and still didn’t find them. At that point, I figured it was a lost cause and decided to get something to eat and explore the city on my own. I knew the full Contiki group was meeting at 5:30, so I had four hours to experience Barcelona however I wanted to. Which, of course, means I went shopping! I spent the next two hours walking around stores like H&M, Zara, Mango and a few jewelry and accessory stores. I bought a couple of really cute, super cheap dresses and a few souvenirs for friends. As I was walking about in search of a shoe store, I ran into those friends with whom I had been separated in the park. What a coincidence! We met and hugged and they said they thought I was dead (an exaggeration of course, but I can still image how scary it could have been for them!) and I explained what had happened. It turns out that I had just come back to out meetup spot much earlier than they had. It was all a miscommunication with time. Reunited, we got sangria at a streetside café, then bought a few more things and a souvenir shop. It was pretty embarrassing when I knocked into a porcelain mug at the shop and shattered it. Not only did I have to pay €20 for it, but a shard of porcelain hit my foot and cut it. So I walked out of the shop with a bleeding foot, an empty wallet and a story to tell. Could have been worse. 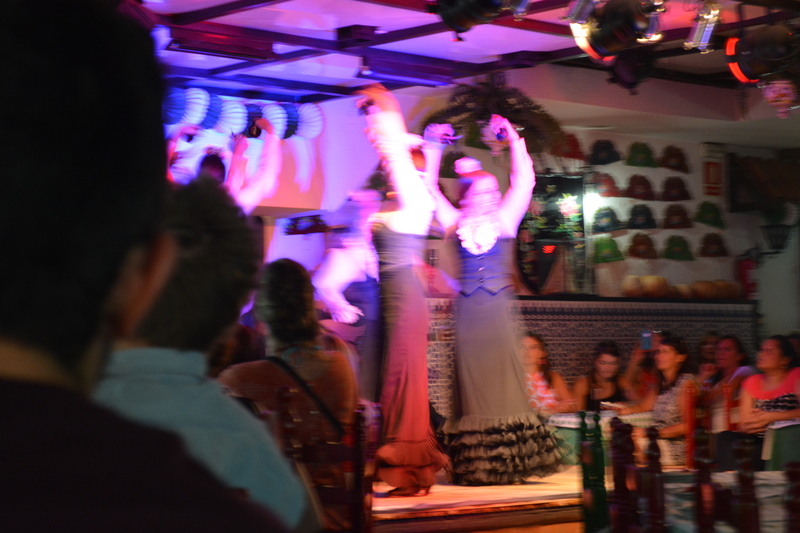 Our free time in the city shortly ended, and we met back up with the full group at 5:30 for a flamenco show. I have been to a flamenco show once before in Sevilla, the birthplace of flamenco and home of the Flamenco Museum. 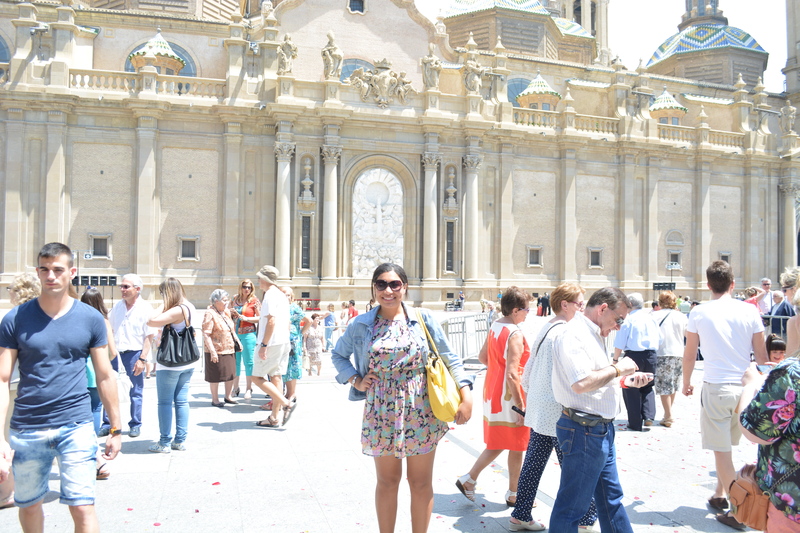 I was, then, a little spoiled going into this show because the Sevilla show was probably one of the best in Spain. We all sat around a table facing a small stage with complementary glasses of sangria in front of us. The dancers were professional and definitely skilled but I do feel that the dresses and choreography were still incomparable to the ones in Sevilla. Overall though, the show was good and I am glad I went. After the dancers finished the audience members were all invited up to the second level of the hall to learn on keys dance moves of our own. This was probably the best part of the flamenco experience but we all got to go crazy dancing on a small stage with lasers shining from the walls. Pretty fun, eh? After flamenco, we hoped back on the coach and headed to Port Olympico for dinner. Being in Spain (though Catalonia would beg to differ), we of course went to a tapas restaurant for dinner where we had some of the best tapas I think I’ve ever had. Well done, Barcelona. Then we headed down the street to meet our tour manager for some drinks at a local bar. We were fortunate enough to be in Barcelona on el Día de San Juan, a major holiday in the country. Most people on the tour went back to the campsite after dinner to join in a beach party that the campground was hosting. But a few friends and I couldn’t imagine missing out on a night out in Barcelona! So, we stayed in the city and had an amazing time dancing the night away with some locals. We ended the night by walking to the beach and watching the fireworks go off everywhere that we’re being set every few feet. The beach was immensely crowded, and we had to dodge people as well as firecrackers going off in the sand, but it was the best way to experience Barcelona the way it’s meant to be experienced. It was awesome. BARCELONA ❤ is love. favorite city ever. I just visited many of the same places you did!